Cam Roller, Cam Rollers, Guide Wheels, Linear Motion Bearings, Linear Rail, Cam Slide, Track Roller, Track Rollers, Track Roller Bearing - Yitong Industry (Ningbo) Co., Ltd.
• Supplying specialized track rollers with high quality in linear motion components for the manufacturers of mechanical equipment. • Supplying linear motion components and cam rollers for automatic equipments. • Producing special bearings with various types under the customers requirements and to bring up the solutions from design to manufacture. Welcome OEM order. Focus on details, pursue perfection, prices are temporary but quality is forever. Become champion in the industry of linear motion track rollers bearings. To realize this objective, taking it reflect on each detail of our staff's job. 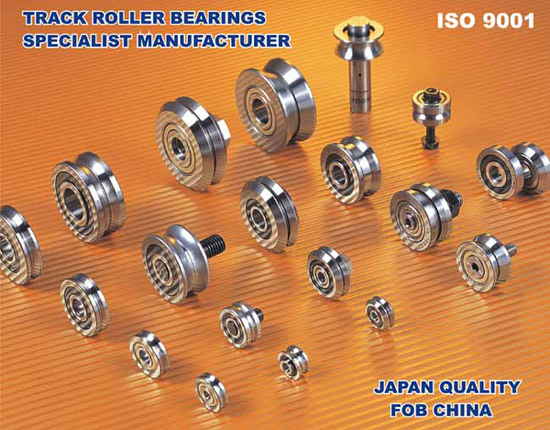 Highlight background: abundant experience of making linear motion track rollers and bearings over more than ten years, and make the cooperation with OEM customers for many years; the team of research, development and production management with high quality staff; special facilities and instruments as well as the inspection methods just for linear motion track rollers and bearings; strict procedure of purchasing the raw material.